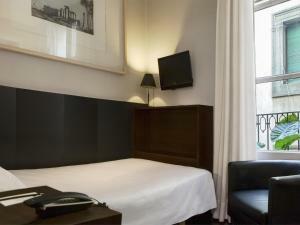 Hotel Banys Orientals is set in Barcelona’s bohemian born district, 100 meters from Santa Maria del Mar Church. 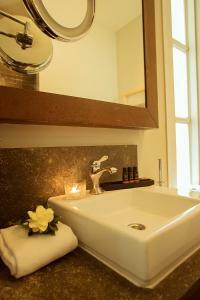 Set in an 18th century building, it offers chic rooms and suites with a balcony. 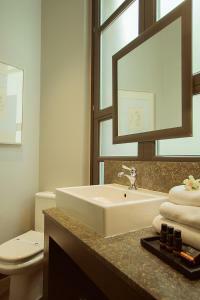 Rooms at the Banys Orientals feature stylish, contemporary décor and soundproofing. Each has a laptop safe, satellite TV, fridge with free water, free Wi-Fi and private bathroom with hairdryer. The hotel’s Senyor Parellada restaurant offers traditional Catalan cuisine. The hotel is set on a pedestrianised street with several bars, restaurants and shops. Las Ramblas is 500 metres away. 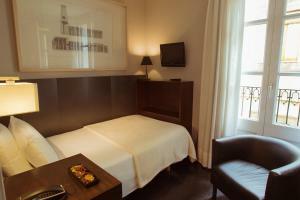 The Banys Orientals Barcelona is set 1 minutes’ walk from Jaume Metro Station and 4 minutes’ walk from Barcelona Cathedral. Ciutadella Park is 8 minutes’ walk away and Barceloneta Beach, 15 minutes. 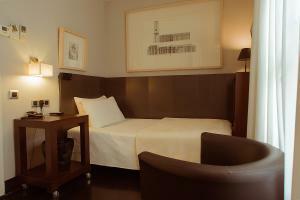 Hotel Banys Orientals Barcelona is 5 minutes’ walk from França Train Station. Direct buses to Barcelona El Prat Airprot leave from Plaza Catalunya, 10 minutes’ walk away. This smaller, chic room features stylish and contemporary décor. Soundproofed and air-conditioned, the room has a laptop safe, a satellite TV, and a private bathroom with hairdryer. There is free WiFi available throughout and a fridge with free bottles of water is in each floor. Rate: € 90.00 ... € 203.00; select dates below to get current rates. This chic room features stylish and contemporary décor. Soundproofed and air-conditioned, the room has a laptop safe, a satellite TV, and a private bathroom with hairdryer. There is free WiFi available throughout and a fridge with free bottles of water is in each floor.